Get Free Shipping on individual 2013 Issues of Tabletalk. The September 2013 issue of Tabletalk features articles examining the thirteenth century of church history. The thirteenth century was a century of contrasts. It witnessed the heights of barbarianism with the Mongol invasion of eastern Europe. 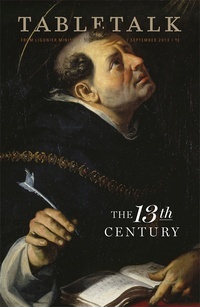 It witnessed the heights of scholastic theological endeavors with the work of Thomas Aquinas. The battle for power in church and state continued as Pope Gregory IX dueled with the Emperor Frederick II, and the battle for the hearts of the people continued with the rise of several monastic orders. This issue will help us better understand where we are by looking closely at where we have been. Contributors include R.C. Sproul along with Nicholas R. Needham, Ryan Reeves, David S. Hogg, George Grant, R.C. Sproul Jr., Simonetta Carr, Alvin Reid, Janet Mefferd, Randy Alcorn.